The amphibious dock landing ship arrived in Victoria for a scheduled port visit, April 12. 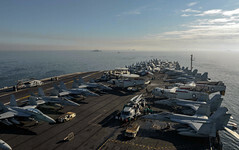 The aircraft carrier returned home to Naval Air Station North Island in San Diego, April 12, after a deployment to the Indo-Pacific region. The aircraft carrier with embarked Carrier Air Wing (CVW) 17, and USS Bunker Hill (CG 52) arrived in the Philippines for a scheduled port visit, April 11. The Military Sealift Command hospital ship departed Bengkulu, Indonesia, April 10. 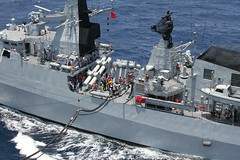 The recent underway replenishment in the South China Sea supports the Royal Malaysian Navy's preparations for participation in exercise RIMPAC this year. 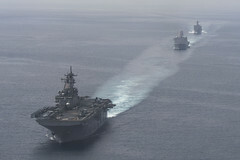 Ships of the Wasp Expeditionary Strike Group sailed with JS Shimokita (LST 4002), April 9. 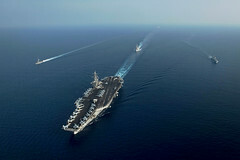 The passing exercise (PASSEX) in the South China Sea, April 6, followed a port visit to Singapore by the carrier strike group. The Los Angeles-class fast-attack submarine returned home from a Western Pacific deployment, April 6, the boat's last before beginning deactivation. Chief of Naval Operations Adm. John Richardson released an updated version of the Navy Leader Development Framework, April 6. As the first fully integrated training period between the ARG and MEU this work-up cycle, the exercise honed the team’s abilities to plan and execute missions.